« Gut Flora and Cancer – The Link Exposed! Celery has been is a traditional Asian folk remedy for many ailments for thousands of years. If you think celery is just a crunchy, low-cal vegetable, it’s time to bring it more into your daily nutrition as a key part of your health support. Recent research has greatly bolstered our knowledge about celery’s anti-inflammatory health benefits, including its protection against inflammation in the digestive tract itself. James Duke, Ph.D., author of The Green Pharmacy, found more than 20 anti-inflammatory compounds in celery and celery seeds, including a substance called apigenin, which is powerful in its anti-inflammatory action. Adding celery seeds to soups, stews or as a salt substitute in many recipes can boost the flavonoid content of these preparations. The antioxidant support we get from celery is largely due to its phenolic nutrients that have been shown to help protect us against unwanted oxidative damage to our cells, blood vessels, and organ systems. As a cancer-fighting bioflavonoid, apigenin has also been studied in relation to breast and ovarian cancers. A University of Missouri study found that apigenin shrank a type of breast cancer that’s stimulated by progestin, a synthetic hormone often given to menopausal women. The study’s co-author, Salman Hyder, noted that apigenin slowed the cancer in three ways…inducing cell death, inhibiting cell proliferation and reducing expression of a gene associated with cancer growth. Blood vessels that feed cancer cells also have smaller diameters in apigenin-treated mice compared with untreated onesâ€¦ resulting in restricted nutrient flow to tumors, potentially starving the cancer and limiting its ability to spread. Meanwhile another study, this one at Rutgers University, found other anti-cancer compounds in celery called acetylenics — which can actually stop tumor cells from growing. They suggest that drinking raw celery juice can prevent free radicals from harming your cells, which can stop cancer from developing in your stomach and colon. Because chronic oxidative stress and excessive inflammation are key risk factors for the development of many cancer types, it’s not surprising to see scientists interested in the potential benefits of celery intake for cancer prevention. While we’ve seen speculation about celery benefits for stomach cancer, colon cancer, and bladder cancer, we’ve been unable to find actual human research studies in any of these areas. Hopefully, future research studies will address the potential cancer-related benefits of celery much more closely. Celery contains another compound, a phytochemical known as coumarin. Studies on coumarins show they’re effective for cancer prevention, and are capable of enhancing the immune activities of certain lines of white blood cells. 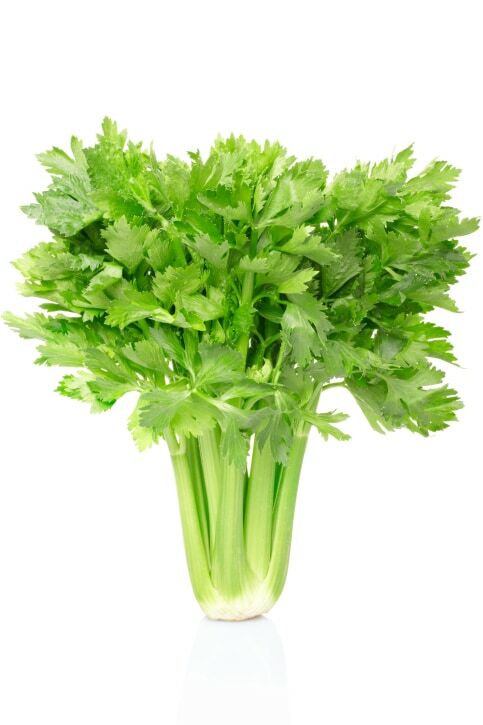 The high levels of coumarins in celery bolster the body’s immunity and enhance the body’s resistance to infection by stimulating white blood cell activity. Celery is chock full of vitamins and minerals, including vitamin K (good for blood and bones), vitamin C (an immune booster), amino acids, essential fatty acids, folate, iron, magnesium, manganese, phosphorus, potassium, selenium, zinc, vitamins A, B1, B2, B3, B5, B6, and E.
Lowers blood pressure and tones your vascular system. Magnesium deficiency is known to affect your blood pressure. Celery is packed with magnesium, which can relax the muscle cells in your arterial walls. This dilates your arteries, allowing your blood more room to flow freely. Healthy flexible joints. Celery’s anti-inflammatory attributes help reduce joint pain and swelling, which means it can help those suffering from arthritis, rheumatism, and gout. It also contains a diuretic that can help remove uric acid crystals from your joints. Asthma. Celery’s high vitamin C levels can help alleviate asthmatic conditions. Colds/Flu. Vitamin C also helps prevent viral illnesses. Insomnia. Sleeplessness can wreak havoc on your health. For a good night’s sleep, drink a glass of freshly-juiced celery with one tablespoon of honey before bedtime. This can help you relax into a restful sleep. Plus, its medicinal properties can work while you sleep. Kidney stones/gall stones. Celery juice can help by clearing the toxins that form these painful stones. Since celery juice is a diuretic, it can help with passing the stone. If you’re prone to stones, a daily glass of celery juice can help keep them away. Possible remedy for migraines, based on celery’s coumarin activity. Aids digestion and alleviates bowel problems. Builds up your immune system. Supports liver as a potent detoxifier. May help protect women from urinary tract infections. Tagged cancer, celery, white blood cell. Bookmark the permalink. Next Level Nutrition | Powered by Mantra and WordPress.